of the medieval fortress, the Castello di Poppiano. of the Castello di Poppiano tradition, and an excellent choice for anyone seeking a complex, yet remarkably subtle Chianti. 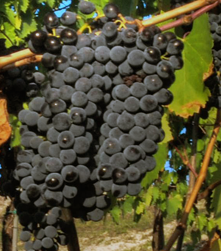 Early theories on the origin of Sangiovese dated the grape to the time of Roman winemaking. It was even postulated that the grape was first cultivated in Tuscany by the Etruscans from wild Vitis vinifera vines. The literal translation of the grape's name, the "blood of Jove", refers to the Roman god Jupiter. According to legend, the name was coined by monks from the commune of Santarcangelo di Romagna in what is now the province of Rimini in the Emilia-Romagna region of east-central Italy.